Scientists have known that key molecules on cancer cells suppress the immune T-cells and prevent them from attacking the cancer. Dr. Ardolino discovers other immune cells, called killer cells, that could offer more immunotherapy treatment options. Although the connection between the immune system and cancer has been recognized for over a century, understanding how the immune system works against cancer has been the biggest challenge for scientists like Dr. Michele Ardolino. Initially, efforts were made to stimulate the immune system to make it attack the cancer. But the game-changer was the discovery that there are key molecules, called immune checkpoints, on cancer cells that suppress the immune cells and prevent them from attacking the cancer. There are many types of immune cells. T-cells have been recognized as key immune cells and the ones that immunotherapy drugs have been designed to target. Dr. Michele Ardolino’s discovery focused on ‘natural killer’ immune cells. He said that even though most of the immunotherapy drugs target the T-cells to make them work better, not all cancer tumours are responsive to T-cells. It is becoming widely recognized that not only is cancer unique to each patient, but the immune system is also unique to each person. Researchers and clinicians are realizing the importance of tailoring the immunotherapy not only to each person’s cancer but to their own unique immune system. It is a complex problem to give a drug that would have maximum therapeutic effect with the least side effects, to be as targeted as possible. Dr. Ardolino recently published a breakthrough discovery that has potential to make immunotherapy treatments to work for more people, and more types of cancers. In October 2018, immunologists James Allison and Tasuku Honjo were awarded the Nobel Prize in Medicine for their discoveries of immune checkpoint inhibitors, considered a landmark in the fight against cancer. 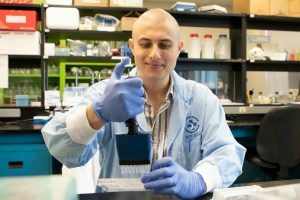 The Ottawa Hospital is raising funds for clinical trials, as research has proven to be the best way to improve treatments and even find cures for cancer and other devastating diseases.